Zarya. The first module launched, so initially used for power and propulsion, now mainly for storage. Zvezda. Provided the first life support, sleeping quarters and work areas on the ISS. Destiny. The main laboratory for US experiments. Columbus. Laboratory for European experiments. Kibo. Also known as the Japanese Experiment Module (JEM), the largest module on ISS. It also has an exposed facility (EF) for exterior experiments. Harmony. Also known as Node 2, acts as a junction point joining other modules and distributes power and data to them. It also has sleeping quarters. Tranquility. Also known as Node 3, used as a gym, recycling and storage area, but also has the large Cupola window that offers panoramic views. 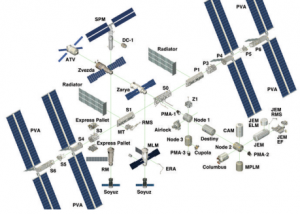 Other elements visible include the photovoltaic arrays (PVAs) that generate electrical power, the radiators that remove waste heat to maintain the working temperature of the ISS, and the Remote Manipulator System (RMS) robot arms. © crystalnebulae. All Rights Reserved.